A collection of empty cigarette packets has shown that more than a tenth of all the cigarettes smoked in the south west came from foreign bought or illicit sources. The packets were randomly collected from streets and easy access bins in the South West. Analysis of discarded packs showed that 12.1 percent were either tax paid or non-tax paid cigarettes from other countries or else they were counterfeits. That does not include hand-rolled tobacco, for which HM Revenue and Customs estimates that as much as half of UK consumption is sourced on the black market. (AGI) Rome, 27 Sept – Financial police found a store of 4,5 tons of contraband cigarettes on the northern outskirts of Naples. 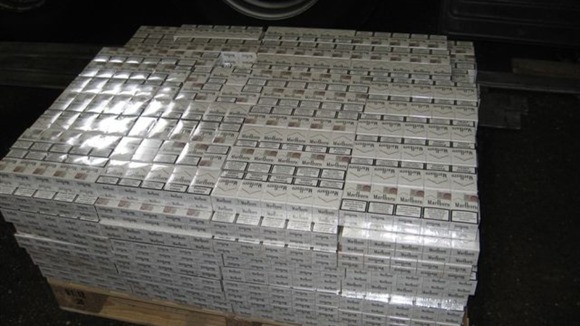 The cigarettes were discovered in a 200 square-metre semi-abandoned warehouse, where the officers checked a van carrying 50 kilos of cigarettes, bearing tax stamps from the Republic of Moldova. Two men were arrested. The financial police said the episode shows a resurgence of cigarette smuggling in the Naples area that is ‘probably one of the effects of the economic and financial crisis’. . .
A draft report by the Virginia State Crime Commission, quotes a Virginia State Police Officer suggesting that cigarette bootlegging is now more profitable than trade in cocaine, heroin, pot, or guns. To the extent that is true, it is possible in part because state and local taxes in high-tax states such as New York and Illinois can add $5 or more to the price of a pack of cigarettes compared to low-tax Virginia or Missouri. A former senior police officer in Northern Ireland has warned that plans to introduce plain packaging for cigarettes could amount to a smugglers’ charter. Peter Sheridan, a former PSNI Assistant Chief Constable with 30 years’ experience, said the introduction of plain packaging would make it more difficult for police to detect counterfeit cigarettes. A UK-wide consultation launched in May asked the public whether tobacco packaging should be changed or if a different option should be considered. Health Minister Edwin Poots has backed plain packaging. More than 60,000 illicit cigarettes bound for the UK have been seized by border officials at Port of Hull. Officers from Border Force found the haul concealed in a specially adapted lorry that arrived on a ferry from Rotterdam. The cigarettes were discovered hidden inside hollow metal beams underneath the trailer’s load of wet wipe tissues. The lorry, which was travelling to Flint, Wales, was registered in Poland and had a Polish driver. The cigarettes, which totalled 63,680, were seized and will now be destroyed. Following investigation, no further action will be taken against the driver.